Minute particles of organic matter, weathered rock and plant and animal life is what makes up the soil that we all know and use. Plant growth depends on us using the very best soil for the job. Soil supports plants and provides them with nutrients, air and water. Not having the right kind of soil to hand does not mean that it cannot be adapted to suit your needs. Waterlogged soil can be drained and vice versa. A vast supply of minerals and additives that can change your soil's properties are available to buy online or at any good garden retailers. Even if you do not have a garden your plants can still thrive indoors by using the right potting compost. We classify most soils by their clay, sand and silt content. These mineral particles change the physical and chemical aspects of the soil. Clay soils are generally more fertile than sand or silt soils but they are heavy and tightly formed, usually causing them to go hard in the sun. Clay soils have slow drainage and warm up slowly in Spring. Silt and sandy soils have a low clay particle count and are therefore not as water retentive. Silt soils are more fertile and hold water better than sandy soils but they do compact. Sandy soils are free draining and not heavy at all. They need regular feeding and watering but can be improved by adding organic matter. Loam soils have the correct balance of mineral particles resulting in good retention and drainage and high fertility. When wet acid conditions prevent decomposition of organic matter peat is formed. Chalky soil is free draining and alkaline and allows full decomposition of matter. Soils are divided into three layers, topsoil, subsoil and a layer derived form the parent rock. Topsoil is generally darker then the others due to it containing the most nutrients and organisms. Organic matter is added by leaf fall or added artificially. Subsoil should be lighter than topsoil, if they are similar in appearance then the topsoil may have a deficiency in matter. The best way to identify your soil is to feel it. By rubbing some moist soil between your fingers you should be able to feel the differences between the types. Clay and loamy clay soils feel heavy, sticky and are malleable. When laid out flat it will show a shiny surface. Silt soils will feel silky to touch. A silty loam soil may be pressed down and imprinted with your finger. Sandy soils feel bitty and are not malleable at all. They can not be moulded into shapes or stuck together, although a sandy loam may be able to. Knowing the acidity or alkalinity of your soil may be crucial to growing healthy plants. Certain plants need a certain pH balance in their soil to thrive fully. Finding out what soil you have can be done using a few methods, and changing the pH balance can also be done. Certain weeds and plants growing in a garden can indicate the type of soil that you have. Rhododendrons, foxgloves and heathers all indicate acidic soil. Viburnum, yucca, cotoneaster (rose family) and forsythia (olive family), to name a few, thrive in alkaline soil. The pH of soil is usually based on its calcium content. Using electronic or soil testing methods to find out the pH balance of your soil is also effective. When a pH is below 7 it is acidic, 7 is neutral and above 7 is alkaline. All soils lose some of their calcium content when it is washed away by water. Alkalinity can be introduced through liming or using a lime rich compost. When testing your soil ensure to test several different areas of the garden, and remember that if you have limed any areas the results of your testing may be inconclusive. Maintaining optimum pH of 5.5 to 7.5 can be easy as long as you know your starting level and what to do to achieve your optimum level. Soils below 5.8 will need liming. This is worthwhile doing if you wish to improve your vegetable crop but is not so worthwhile for just plants. It is much easier to choose plants suitable for the conditions of the soil. If you have made the decision to lime an area then go for ordinary calcium carbonate. It is safe to use and easy to handle. Other methods such as quicklime - calcium oxide and hydrated lime - calcium hydroxide can be caustic, hard to handle and you could easily over lime the area. If planting in soil with a level over 7 top-dress with sulphate of ammonia and mulch with acid compost to reduce the pH level. This is only short term though and will need to be repeated following manufacturers guidelines. Soil pH affects a great many things, it is not just the plants health that is determined but also how the pests and diseases thrive. Acidic soils attract wireworms and clubroot but deter worms. Alkaline soils are where potato scab and chlorosis of leaf vegetables most appear. A pH level of 6.3-6.8 is also the level preferred by most soil bacteria. However fungi, moulds and anaerobic bacteria have a wider spectrum of tolerance and can multiply at lower levels. In order to maintain maximum soil fertility you have to have certain organisms such as beneficial bacteria and fungi present. Mites help along the process of matter breakdown and certain worms such as microscopic and nematodes help with pests, although some are pests themselves. Earthworms contribute to aeration and drainage by passing the soil through their bodies and binding it into crumbs. Some pests such as nematodes and honey fungus, that are found in soil can be so resistant to barrier methods and aggressively persistent that soil sterilisation may be the only answer. This method should only be used after all other methods have been exhausted as it is indiscriminate between the good pests and the bad pests. This may lead to future issues with harmful pests who may revisit the garden to find there are no natural predators there to keep the numbers down. Soil sterilisation can only be carried out by a trained operator as it is extremely poisonous and so it will cost you money to have it done. The chemical is applied to the soil and it seeps through the soil pores. The soil is then covered with plastic to stop the gases from getting out. It will then take approx 3-4 weeks before the soil is ready to be planted in. We all use our favoured methods of cultivating soil, be it digging, weeding or adding soil enhancements and these are all paramount to our plant's life spans. Weeds have to be eradicated before they strip the plants of all the vital nutrients that they need. When left to grow weeds compete for all of life's essentials, water, light and space. They may also carry diseases that can destroy some of the plants in our gardens. Weeding regularly by hand is the best method as it means that you can get the whole of the plant up and you will cause the least amount of stress on your surrounding plants. Digging up soil to prepare for planting, or digging round existing plants, can be extremely beneficial for maintaining drainage and aeration. Additional materials may be added to improve conditions if needed. Generally single or double digging with a spade is sufficient to improve soil conditions. Garden beds however have a smaller area to work with and usually packed with plants so you will find that a fork is better used in these conditions. Digging can have its downside too though, it can decrease the breakdown of matter which in some soils can reduce fertility. And if not dug consistently some soils may compact with time which causes poor aeration and drainage. Dig in autumn when the soil is exposed to snow and frosts as this will help to break it down. Do not dig wet, heavy soil as this can cause severe damage. Forking is best used for turning the soil and clearing the weeds. The structure of soil determines whether air, water and nutrients can flow freely. A well structured soil has plenty of pores in a system that allows all of these through. A poorly structured soil can allow to much water through thus becoming waterlogged and nutrients may be lost. Poor structure usually means the soil is too dry in summer and too wet in winter. Water will either run off the top or sink in too deep. During wet conditions avoid walking on the surface or digging as this will compact the soil and make it too heavy and hard for the plants roots to get through. It will also cut off the oxygen supply resulting in zero germination. Double digging and incorporating additives will help the soil particles to turn into crumbs which in turn will improve drainage and aeration. Additives such as manure and compost are good to use as they encourage natural workers such as earthworms. Sandy soil may benefit from small amounts of clay and heavy soil can be lightened by using vast quantities of sand and grit. Clay soil will benefit from using manure and compost. Silt soil may need small amounts of clay and manure. When using additives ensure you are using the correct ones for the soil you have. Fine sand for example can block pores in heavy soil causing further problems, use gravel or coarse sand instead. Ammonia in fresh manure can damage certain nearby plants, always try to get rotted or composted manure. If you only have fresh manure put it on top of the soil in autumn and do not cultivate the soil over winter. This will give it chance to rot and the earthworms will help to get it into the soil. When using garden compost ensure it is not contaminated with virus or weeds, any such stuff should be burned. Fresh bark, leaves and straw decompose using nitrogen which they take from the soil, this must be replaced. Follow manufacturers guidelines if using bottled or powdered products. Watering is done to ensure the soil is completely recharged and has enough supplies to last until the next rainfall or watering. Thorough watering is crucial to ensure the water gets as deep as possible. Knowledge of your plants and soil will assist you in knowing how to water, when to do it and how much to give. Certain plants may be susceptible to drought during the year, others may be able to go without. Your soil may be good at retaining water or a lot of it may get lost. How much it rains is also a factor. Water excess in soils may be a damaging as them drying out so maintaining the right balance is crucial. A well structured soil will retain water as well as letting it flow freely to the plant via its pores. Different methods of watering include removing some soil from around the plant and filling with water, or burying a large pot with drainage holes close to a plant and filling the pot slowly. Drip feeders and sprinklers also provide a constant supply of water that is delivered to the roots gradually. Never water a plant so that you get puddling, this will cause soil erosion and the majority will run off from the plant. Clay soils have a large amount of fine pores that plants may find it hard to get the water from, this is why they hold the most water. Sandy soils have larger pores meaning the plants have easier access to the water in them, they do however drain a lot. Loams are usually balanced between good drainage and finer pores for retention. Controlling weeds ensures the water you give is taken by your plants and not the uninvited ones and mulching the soil improves penetration of rain and cuts down evaporation. During the summer it is not uncommon for the water supply to be less than the water use. Water deficiency can occur causing problems for the plant. When a plants growth rate slows it will wilt. Additives such as manure when dug in can prevent deficiencies but constant watering is vital. Taking rainfall measurements each month is a key part of knowing when best to water however with dramatic climate conditions being what they are only use the average numbers you get as a guide. When buying seeds or plants etc always check the packaging in which they come. The guides will show you how moist or dry they like to be kept and critical periods of growth in which more water may be needed. Drought conditions can even be useful to some plants by improving flavour of fruits and vegetables, especially tomatoes. Many plants thrive in drought conditions such as cacti, agave, lavenders and grey and silver leaved plants. Grass will tolerate drought, it may go slightly brown but will return luscious when it next rains. Summer watering is not needed for grass. Use water storage areas such as water butts to put back into the garden natural water which you have collected. Compacted soil will retain water too much causing waterlogging. Bog plants love this sort of soil but others do not as their roots are not able to function correctly. In particular boggy areas of your garden where drainage may not be suitable choose plants that want to be there such as Gunnera manicata, ferns, hosta and iris. Mineral deficiencies can occur in wet soil due to lack of nitrogen. Clubroot also thrives in wet soil. To improve drainage create ditches so that the water lying on the top of the soil has somewhere to run into, additives dug into the soil such as gravel and sharp sand can help in less severe cases. When severe waterlogging is found it may be preferable to install a drainage system, this should be done using professionals. When your soil is unable to produce the essential nutrients it needs you may need to replenish its stock with some additives. These can be chemical, natural or organic. Plants need macronutrients such as nitrogen, phosphorous, potassium, magnesium, calcium and sulphur in large quantities. Micronutrients such as iron, manganese, copper, zinc, boron, chlorine and molybdenum are needed in smaller quantities. Most soils only require additives of nitrogen, potassium and phosphorous. Deficiencies of these will cause reduced growth and leaf discolouration. Iron deficiencies will cause leaves to turn brown especially in the cases where acid plants are being grown in alkaline soil or being watered with hard water. If you have made the decision to go organic in your garden it is still worth sourcing the very best additives you can find. Compared nutritionally organic matter is less effective than chemical products but if the batch is good it can have longer lasting added benefits. One tonne of manure can deliver 6kg of nitrogen, 1kg of phosphorous and 4kg of potassium. A chemical solution of the equivalent amounts is only 30kg. Manures however are bursting with bulky waste matter that has many micronutrients in its contents, can give long term nitrogen effects and provides excellent conditions for earthworms to live in. Green manures which are plants grown purely for the purpose of digging up and putting back into the soil are also a good idea for organic growers. Ensure you pick your plants wisely and stay away from the invasive ones. Rye grass, borage and comfrey are good examples. There are many soluble inorganic mixtures and slow release products on the market ranging in price, size and manageability but make sure you pick the right one for your soil and plants and follow the instructions carefully. Organic mixes of blood, fish and bone are effective when the eco system in your soil is thriving. Organisms break down the slow release formulas and work them into the soil so applying the mixture when these organisms are dormant ie in cold weather could be costly and ineffective. Used to improve soil conditions by adding nutrients, reducing water loss and increase of organic content top dressings and mulches aid in plant growth. They are placed on the soil surface for purpose or indeed decoration. The term top dressing is used to describe additives being used on lawns and soil and secondly to describe fertiliser applications around plants. Gravel & bark is used to provide quick drainage for potted plants and beds, Using this method around plants such as alpines not only has a beneficial result but also draws the eye to the plant when it is surrounded by decorative gravel. Mulch comes in both organic and inorganic forms. To prepare for mulching always remove any weeds that may be lurking otherwise they will draw in all the nutrients that you need for your plants. Application should take place in spring when the ground is warm otherwise the mulch will retain the coldness of the soil through insulation. When mulching around a particular plant spread the mulch around the base of the plant and extend out to directly underneath the outer leaves. 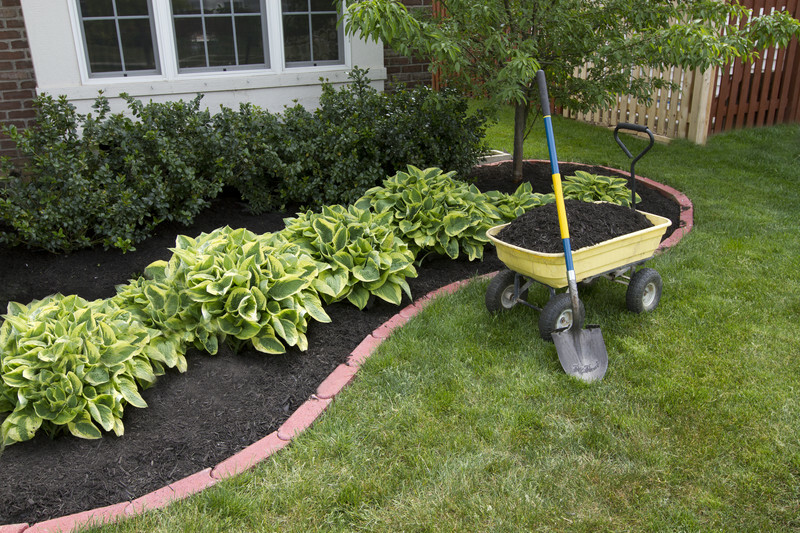 Applied loosely the mulch will retain water, discourage weeds and maintain a regular temperature. The mulch should be applied 4-6in deep. If choosing to go organic then coarse bark is the best choice for you. This will prevent weeds from sprouting and any that do appear may be pulled out easily. Peat and garden composts will improve the condition of your soil when used as mulch but they may provide a better habitat in which weeds can grow. They will also break down into your soil easier than bark which means regular mulching may be needed. Inorganic mulches consist of plastic sheeting which can be laid out around your plants and pinned down using pegs. These will not however allow any water to penetrate through to your soil or allow water to evaporate upwards through them. When using this method ensure your soil is not dry or waterlogged. To combat these problems pierce holes in the sheeting through which you can water and place additives if needed. Floating mulches such as fleece rise as your plants grow, they can also act as protection from pests. Compost can be found in two forms, garden compost which consists of decayed animal, plant and food materials and potting compost which is manufactured specifically for use in pots and containers. When your garden compost breaks down to a level where it is dark and crumbly it can be added to your soil to aid productivity. It is easy to make your own compost and there are a wide range of products available to help you. Caddy bins kept in your kitchen are handy as you can put all skins and peels in without trekking to your bin each day. Place a biodegradable bag inside and when it is full place the entire bag and its contents into your compost bin. Vermicomposting is the product of using worms to aid in the breakdown of your compost. Vermicompost is a natural fertiliser, soil conditioner and is rich in nutrients. Composting worms are widely available, sometimes sold as bait. Earthworms and bacteria together play an integral role in the decomposition of matter. Use on a small scale to turn your everyday kitchen waste into high quality soil. Creating a vermicomposting system is easy and inexpensive. When creating your own compost heap ensure to use matter rich in nitrogen and carbon. Paper, bark and small amounts of grass clippings will provide these. Do not compact your grass clippings as air will not be able to flow freely. Burn any weeds that have set seed or are about to as they will infiltrate your compost and contaminate it. Manure is a good source of nitrogen and will speed the process up. Your heap or bin should be approx 1 metre wide and high. Temperatures hit a high in approx 2-3 weeks. Ensure the compost is turned regularly as this will aid with breakdown. Your compost should be ready in approx 3 months. Odours emanating from your heap or bin can also give you an idea as to what is going on in there. A rotten egg smell shows you compost is lacking in air and a whiff of ammonia means the nitrogen content is too high. The John Innes Horticultural Institute of Great Britain first formulated potting composts in the 1930s. These consisted of loam based mixes that included coarse sand and peat. Loam free composts came onto the market in the 1960s.Always ensure when buying potting composts that the product you are buying is suitable for the type of planting you are doing. Loam based composts provide longer growth rates than their loamless counterparts. They are free draining, provide a stream, of nutrients steadily, have good aeration and are structurally sound. Transplanted plants from loam based composts grow more readily into the soil. Loamless composts have good aeration and moisture retention and are long lasting. They do however break down more easily than loam based composts meaning that the some of the volume of the compost gets lost taking with it its basic structure. They do not hold nutrients quite so well either meaning that your plants will need to be fed more, and transplanted plants may find it harder to adapt to their new conditions. Using peat based composts are environmentally unsound as they are taken from habitats where the peat supply is depleting. The need may arise for the use of a specific compost to aid in growing particular plants. You can almost guarantee that what you are looking for is on the market. Orchids for example have their own compost that contain charcoal and fine bark, this makes it free draining. Cactus and alpine composts lack in nutrients as that is what the plant requires for healthy growth. Certain lime hating plants may require ericaceous compost as they have a low pH. There are also a wide range of propagation compost designed specifically to aid in germination. Check the packaging of these to find out which one is best for you.